The API i developed for RichFLV implements most of the FLV file specificaton and some parts of the SWF file specification in Actionscript. It`s all done with pure Actionscript (Byte Array Baby!) so no external tools are used. The cool thing is that the only thing that depends on the apollo framework is the part were RichFlv actually saves the files to your desktop (FileStream.writeBytes()). The same could be done as a none apollo app in the browser and than send to the server. Imagine this as an extension to popular video sites. It would enable real flv remixing in the clients browser! I would not use files bigger than 30 mb. These problems will be corrected until RichFlv reaches 1.0 status. 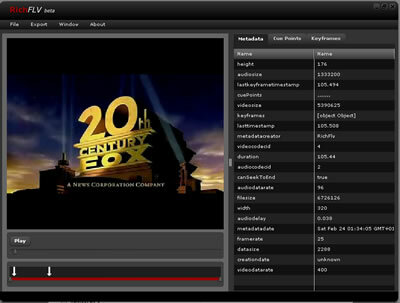 Future versions will have the ability to mix several flv together to one file. I have this all ready but need more time on the UI. Updated to Alpha 2.0: See post here. !!! New Version Available See This Post !!! Watch a quick introduction Video here. This entry was posted in Apollo, AS3, Flex, Flex 2, Tools by admin. Bookmark the permalink. thanks for your interest but unfortunately it is and will not be for sale. We do a lot of volume and to be able to batch fix a whole directory of videos would be helpful, just like FLV Metadata Injector offers. However, since FLV Metadata Injector isn’t AIR, then yours would have the advantage of being cross-platform. great work!! the RichFLV is a promissory project. What’s your future development roadmap for this product? Are you planning to sell it commercially or will it be free always? Thanks. Sorted the prob! Iam now up and running!! @Darren: Great! How did you solved it? Pingback: 50 ???????? ????? ??? ?????????? | ??????? ????? ????????? ??????? ????????? ????? ????? ?????? ?????? , ????????? ??????? ????? ?, ???????? Yes Sorted the prob! Iam now up and running!! How is the editing function used? 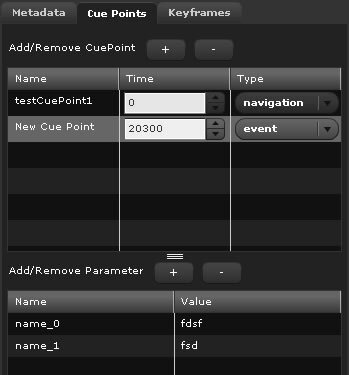 I can save anything from the beginning of the FLV on, but if I try to grab a part anytime after that, it just erases anything I have between the cue points. Thanks! I am having a problem when exporting to an SWF file the program just hangs in a processing mode. Any answers to this? First time it was little bit difficult to use it but nice program.. Please, could you tell me how can I join videos. Thanks. Thanks for the great tool. I’m sure you probably know this but Export to MP3 results in a file that won’t play in any player I have. Trying to import the MP3 causes RichFLV to hang (o% analyzing). Pingback: 18??? ?Adobe AIR???? | ??? If I try to save a file with a name other than your defaults (testStitch or default) I get junk files that won’t play. Saving using defaults and then renaming works OK.
I’m trying to stitch 6 files of about 60Mb each but get stuck trying to add the 5th one…. I`m not working on RichFLV anymore. Don`t know if I`ll ever find the time to pick up the project again – but who knows. Pingback: 6???? Adobe AIR ?? How to encode a videoclip in .avi (or else) ? and how to encode a sound in .mp3 for example ? NB: my .swf will run locally under AIR, and I would like generating videoclip or musik as files on the local user’s folder. Thanks in advance for any hint..
Hi, really nice stuff. I wish to do something similar, can you give me some advice how to start? I wish to have online application to upload videos, cut them, add images and text and export to flv. Is it possible? It’s absolutely amazing little software for flv video files. Helps so much with my work. I’ve spent hours trying to find something what will help me to cut out parts of our files and prepare for streaming. GREAT WORK KEEP IT GOING. Under each of the menus I’m looking for any of these words: “split” “divide” “cut” and nothing. How does it work? I’ve opened an FLV file, and moved the playhead to the point where I wish to divide it, but nothing under the menus for me to choose. Also, is RichFLV destructive? I’m working on a copy of the file, since I assume it is. this would have been so awesome but just can’t seem to get it working. got it installed and it opens but hust doesn’t seem to work as far as cutting and creating new start points and such.. Thanks tho. Sorted the prob I am now up and running!